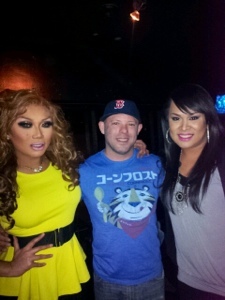 I love it when they are in town and I love how Jujubee performs. Couple of weeks ago, Jujubee and now total celeb status fiancee Chris was in Seattle once again to perform at Rplace. Jujubee was also booked to host the Mr. & Miss Gay Seattle that weekend so they had a full weekend here. It's always nice to see these to and get to chat a lil bit whenever they are in town. Everybody was raving about Chris' proposal while Juju was in Rupaul Drag Race All-Stars. I make it a point to get a pic of them two together everytime they are here. They are such an adorable couple. Looking forward on seeing you both again soon.